Ask anyone on the Seattle Refined team, and they'll tell you I love french fries the most. I also love chowder, so the two together? Sounded like a dream. Pike Place Chowder claims to be make the best clam chowder in the city, and America - with the awards to prove it. Serving up gold medal New England Chowder, Seafood Bisque and Tomato-Based Manhattan Clam Chowder. But the idea for chowder fries came a bit by happenstance. "We had customers ordering chowder and fries and [they] were dipping the fries in the chowder," said manager Nery. 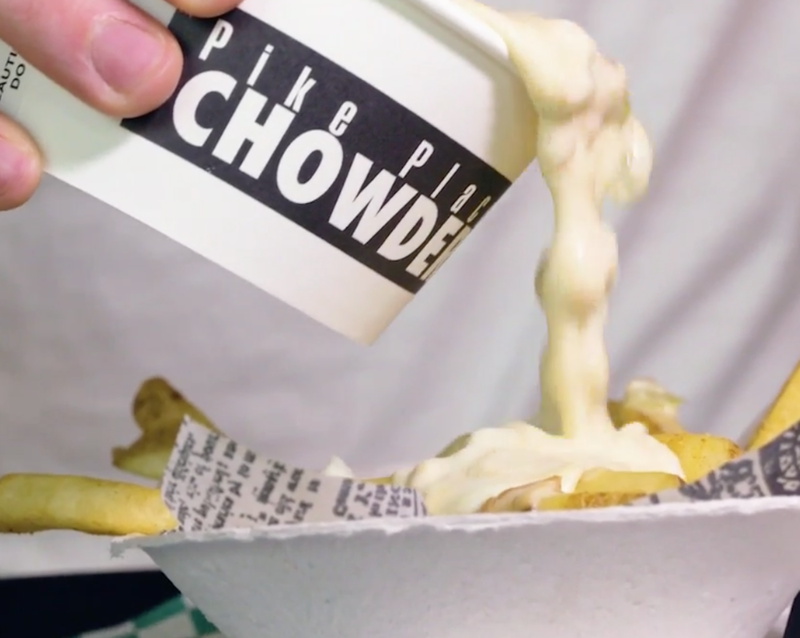 The just to selling chowder straight on the fries was a pretty logical next step. The deep frier is a promising start to any gastronomical delight, so what could go wrong? The fries are crispy, golden brown and smothered in gold medal Pike Place Clam Chowder. The dish kind of reminded me of biscuits and gravy, but with clams instead of sausage. Still delicious. So yeah - move over Brandon and Malia - I think my fries definitely won out this competition!